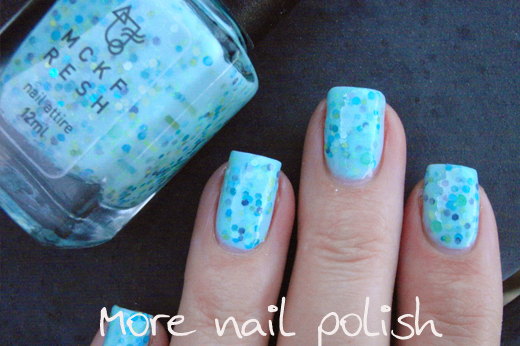 I have the three glitter polishes from Mckfresh Nail Attire's Spring Dreaming Collection. 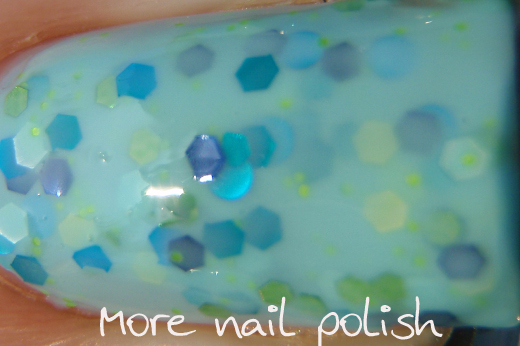 Sun Shower - a beautiful blue crelly base with matte and holo navy, green and blue glitters and neon green dust. There is heaps of glitter in this one and you will want to make sure each layer is dry before doing the next, otherwise some glitter can pull through the base and leave drag marks. A perfect spring shade. This is three coats with top coat. 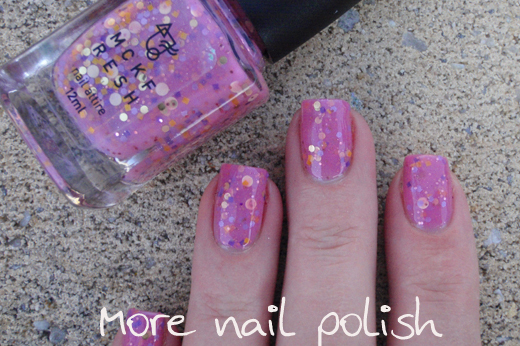 Wild Flowers Bloom -a pink shimmery crelly base with yellow, gold pink and purple glitters. There is so much variety with the glitters in this polish I'm not sure if I mentioned them all. I love the combo of the pink and yellow/gold, it really does remind me of wild flowers. This is three thin coats with Seche Vite. 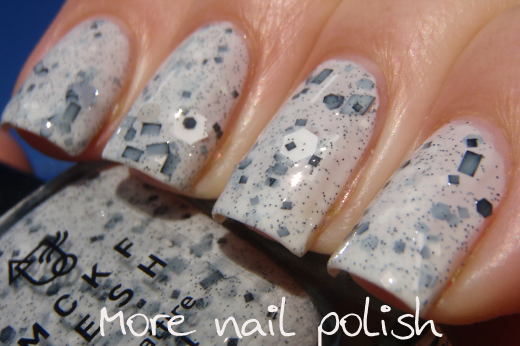 Go Back to Sleep - a white crelly base with a mix of black, white and grey glitters in lots of shapes and sizes. 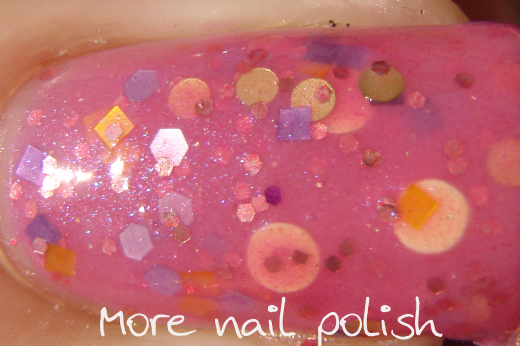 Again, lots of variety with the glitters here, and because of the creme base, you will need to make sure you wait for each coat of polish to dry. 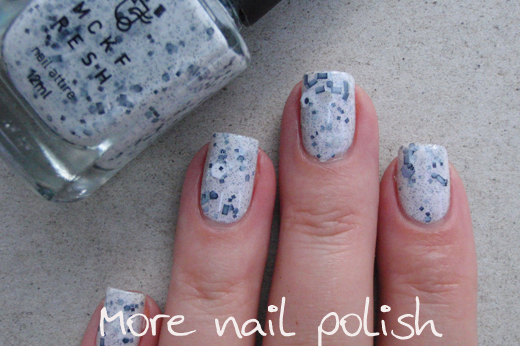 I think those black rectangle glitters are really cool and unusual. 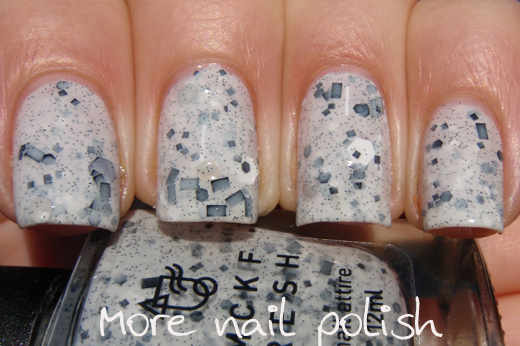 This is two coats with Seche Vite. Mckfresh Nail Attire is available in Australia through their Etsy store and available for International purchases from Mei Mei's Signatures.As with all indie brands, you best place for updates is their Facebook page. The first and second are so juicy and gorgeous! Oh milky, the first one is a winner for me!